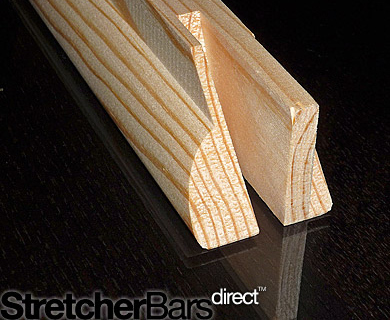 At Stretcher Bars Direct we’re ready to fulfill your stretcher bar requirements with our fine quality pine stretcher bars made exclusively for us in Europe. We offer a growing range of stretcher bars to suit every canvas stretcher bar customer. 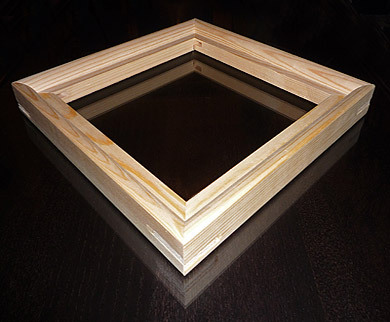 They are perfect to produce top quality stretcher bar frames for stretched canvas art and inkjet canvas prints. We hope that you enjoy this online stretcher bar shop and the Stretcher Bars Direct experience, please let us know if we can help you in your business. We believe that quality matters, if you do too then we think you’ll like what we have to offer. Stretcher bars should be strong, they should be straight and made using wood from well managed forestry. Stretcher bars should be clean, dry and spore free as not to adversely affect the canvas being wrapped on them and we also think it’s fair to expect your bars to fit together without issue. On top of that there is the aesthetic aspect and sense of value to consider, after all we are dealing with an art product and the frame is an integral part of the piece. Our European stretcher bars are made from quality North European Redwood Pine, they're super smooth and have a quality weight and feel in the hand. They are machined to the highest standard with no wastage per box. We also include free tough wooden wedges. We also believe that service matters, which is why we carry large quantities of stock to avoid out of stock situations. We offer swift next working day delivery for orders placed before 2pm using the industry leading APC network. Enjoy Free delivery to most mainland UK destinations for orders over £85 (net) and you can even have it by midday for just £5.50+VAT. We supply customers of all sizes at trade prices with discounts of up to 20% available online depending on order value. Choose Stretcher Bars Direct for all your stretcher bar and canvas stretcher bar frame requirements and we’ll do our best to impress. Stretcher Bars Direct is part of Paper & Canvas Ltd; an established Company supplying fine art inkjet canvas, decor inkjet canvas, fine art inkjet paper, giclee varnish and liquid laminate to the photo and fine art wide format print industry. We pride ourselves in providing excellent products and service and look forward to delivering these fantastic European stretcher bars to our new and existing customers. To find out lots more information and photos visit the quality guide. Once you've seen them for yourself, we're sure that you'll be just as excited as we are about these great quality frames!